This recipe is for all coconut cream lovers. You can serve this chilli coconut chicken gravy with boiled or egg fried rice. The creamy texture of this gravy makes it so tempting that you can’t resist it. Pour the chicken stock into a measuring cup or small bowl, crumble the cream coconut into the chicken stock and stir the mixture until the coconut cream dissolves. Heat the oil in a wok. Add the chicken strips and cook stirring until the chicken turns into a golden color. Stir in the chopped red chili and green onion and cook gently for a few minutes. Add the peanut butter, coconut chicken stock mixture, and lemon rind and lemon juice. Simmer it. Uncovered it for 5 minutes, and stir it frequently to prevent the mixture sticking to the bottom of the wok. 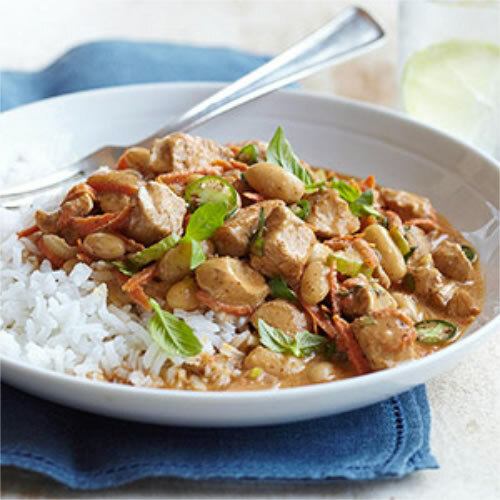 Transfer the chili coconut chicken to a dish and garnish it.